If you would like to build global connections and immerse yourself in several cultures as you study for a professional graduate degree, you might be interested in learning the difference between a Global MBA and International MBA programs. While both apply a global perspective to business studies, the layout of each type of program is very different. You will need to take time out of your busy day to learn about what a global program entails along with what an international program entails, read on and get a straightforward explanation so that you can make an educated decision about your graduate education. What Are Global MBA Programs? All general MBA programs are beginning to focus on business from a global perspective, because business transactions are so interconnected. Technology has made the world smaller and the need for professionals who can effectively deal in international markets is growing out of control. 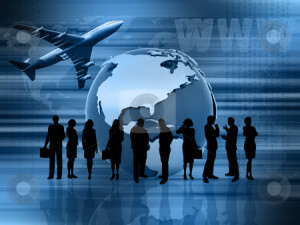 Now, a new type of MBA program is being offered that is commonly referred to as the Global MBA. A Global MBA program, while there is not one standard definition, is a program that has an international orientation of the curriculum and materials and a diverse student and faculty base. Global business schools will have multiple locations that you can attend classes at across the globe, partner programs located overseas, and business networking opportunities for students and alumni. The biggest difference between global programs and other programs is that you will study in geographically diverse areas where you are exposed to foreign languages and to new cultures instead of studying in the US the entire time you attend business school. What are International MBA Programs? One of the biggest drawbacks of the Global MBA is that students must drop their life to move to a new country. Since most MBA students are adults with children or an established career, uprooting their lives to immerse themselves in other cultures may not be practical, affordable or realistic. International MBA programs are another option where you can stay on US soil and still study global business curriculum while you meet other professionals from different regions of the world. International programs are often administered on US soil but accept many international students to keep the student body as diverse as possible. A new trend shows that diversity is high in demand but that most students want to study near home while enjoying global networking opportunities. With a rise in the number of students enrolling in International MBA programs, you might want to consider how these programs can enhance your recruitment opportunities, according to Forbes. You should be sure that you are ready to compare tuition costs and program duration before deciding on which program is right for you. The workforce in the United States is becoming more diverse than ever. If you want to learn how to do business in other countries or how to do business with other countries, you have to compare all of your options. Compare the benefits of studying overseas versus the benefits of earning a US-based program. After you know the costs and you have really contemplated what you will be missing if you study away from home, you can make the decision that is best for you and your career. With this information on the difference between a Global MBA and International MBA, you can make an informed choice.